This BIT cache is along the Nowak Pier in Buffalo, NY, although it's more commonly known among the locals as the Bird Island Pier. But a plaque near the beginning identifies it as being named after Henry J. Nowak, who representated the Buffalo area in the House of Representatives from 1975-1993. Mr. Nowak is 77 years old, as of the date of this cache placement. The Nowak Pier extends about 2 miles, seperating The Niagara River from the Black Rock Canal. 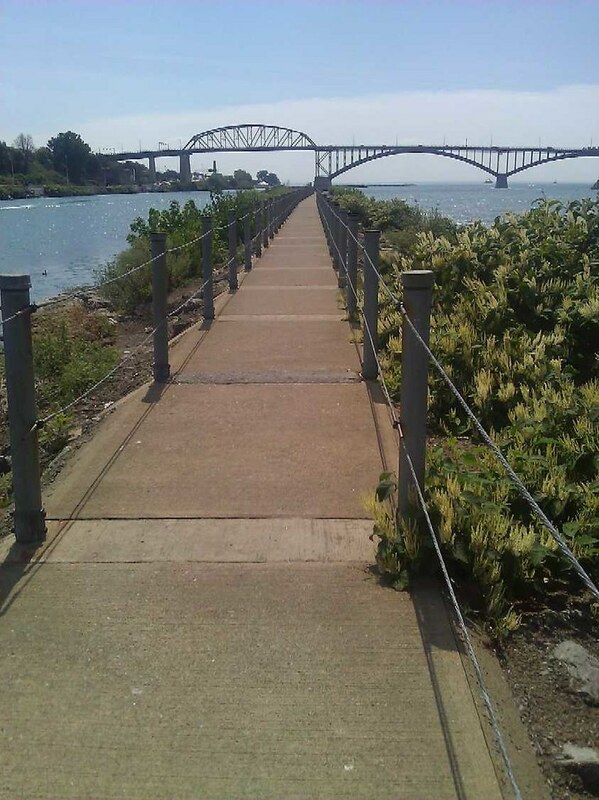 However, since August 2011, you can only venture as far as the bottom of the Peace Bridge, which connects Buffalo to Fort Erie Ontario. The pier has been deemed unsafe for pedestrians after this point. Personally, I don't believe it, and many fishermen go around the gate, but I'm not going to place any caches or Munzees beyond that point, which is about 1/2 mile one way walk from the start of the Pier. So what you are going to find here is 7 BIT caches, and 7 Munzees, staggered, and placed slightly over 300 feet apart. The logging passwords for the BIT's contain random numbers, you'll probably want to write them down, or take a picture of them with your cell phone. You will also have the option to scan the QR code, and log them from the field, although I personally have not had much luck posting logs to OCNA with a mobile web browser, and they end up being blank. Your results may vary. Hints for all BIT's assume walking from the Parking area towards the bridge. Enjoy the walk, it is definitely a unique and scenic location. W 78° 54.175' Turn off of Niagara Street onto Robert Rich Way to get on the Island. Park here in Broderick Park. If I remember correctly I had a little trouble finding this one. And I had to wait out a couple muggles out for a stroll. But I was able to get it after they passed by. Cache will be temporarily unavailable. Tried a new attachment method on most of these, but this one remains unfixed while I see how it works.